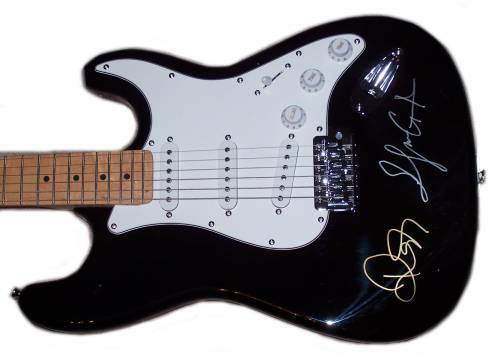 A black electric guitar signed by Graham Russell and Russell Hitchcock of Air Supply. Comes with Certificate of Authenticity. Air Supply is an Australian soft rock duo, consisting of Graham Russell as guitarist and singer-songwriter and Russell Hitchcock as lead vocalist. They had a succession of hits worldwide, including eight Top Ten hits in the United States, in the early 1980s. They formed in Melbourne, Australia in 1975 and have included various accompanying musicians and singers. ~ Wikipedia.